Orange, yellow, blue, green, take your pick from the rainbow of cute colourful sea-facing bungalows at Sipadan Dive Centre Mabul. 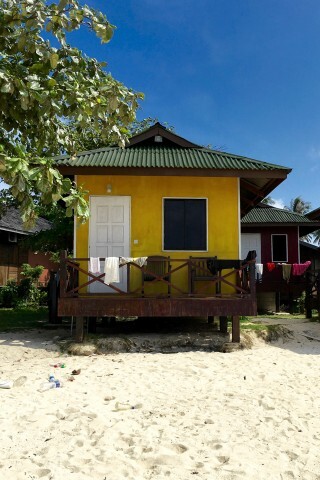 Or if ringgit in your pocket is more of a priority than a view, a longhouse dorm back from the beach. Sitting at the northernmost point of Mabul, this small resort has a bit more than the basics covered—not only do you get white sand beneath your toes, but air-con and hot showers are standard, even if the rooms are somewhat tired and simple. Very basic ensuite and share bathrooms are clean and the chalets enjoy small furnished balconies to revel in that sea view. Buffet meals are served in the open-style restaurant where you can refill your drinking water and help yourself to coffee and tea all day long. Our only gripe with Sipadan Dive Centre Mabul is that the beach in front has little a bit of rubbish, not as much as the neighbouring village, but enough to be notable. Prices on their website are inflated and not good value, but walk-in rates are more reasonable. Go for a chalet over the dorm if your budget stretches as we were quoted a 20 ringgit difference and they are far superior. As the name suggests, Sipadan Dive Centre Mabul can sort you out for an underwater adventure, too. Room: Dorm air-con, low season: 170 ringgit, high season 170 ringgit. Notes: Includes meals. Room: Bungalow air-con private bathroom, low season: 190 ringgit, high season 190 ringgit. Notes: Per person, includes meals.